If you want a cheap family holiday which combines fun, adventure, and plenty of activities for kids look no further! Camping, in a moveable tent or caravan, is a relaxing and affordable outdoor activity that can be enjoyed in a number of locations from national parks to beaches. This video offers simple advice to get your family started on your first camping adventure! Will Your Kids Enjoy Camping? Although doing without luxuries may not appeal to everyone, camping is not a primitive experience. Many camp sites now offer full bathroom facilities, cooking areas, and even restaurants, so no matter what level of comfort your family requires there are probably camp grounds to suit you. Exercise - often camp sites are off the beaten track so you may need to hike to reach them, or they may be beside the beach with opportunities for swimming. Excitement - camping is a big adventure for young children who often love the novelty of cooking their own food and sleeping outdoors. Builds resilience - learning to cope with adverse weather conditions and lumpy ground can help kids become tougher and more able to cope with life's lumps and bumps. Teaches survival skills - learning to cook, catch fish and build a fire are all valuable experiences that can help to teach kids about living in the wild. Opportunity for quality time - with no TV, computers or video game consoles, there is nothing to do but interact and relax with your family - hopefully for some ActiveActivities! Children of any age can enjoy a camping trip, although it may be more challenging with very small babies or active toddlers. 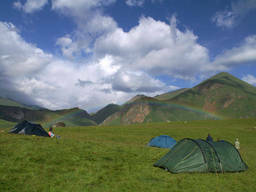 Camping is great for nature loving kids and for city children who don't get to experience much of an outdoor lifestyle. Commercial campsites - offer good facilities but can be crowded and expensive - best for inexperienced campers or those with a caravan or campervan. Free camping - no cost but also may lack facilities. Best for experienced campers who are looking to truly get back to nature. National parks - often have basic facilities, but can be in remote camping locations so it's a good idea to have plenty of supplies. Usually there is a minimal cost, although there may be restrictions on bringing pets. If you are taking your kids camping, it is important to be aware of the environment and any rules governing pets, fires and food. Make sure you have good quality camping gear. Always check the weather forecast before you go, and don't forget to plan a few kids' activities for the journey if you'll be driving for some distance to reach your destination.